Samsung Galaxy Note 8 PyeongChang 2018 Olympic Games Limited Edition has been unveiled in Seoul, South Korea, to extend the company's Olympic legacy. The South Korean company will give more than 4,000 units of the Limited Edition Galaxy Note 8 to athletes and the PyeongChang 2018 Olympic family, including the International Olympic Committee (IOC) and the 2018 Olympic and Paralympic Winter Games (POCOG) staff before the games begin in early February. 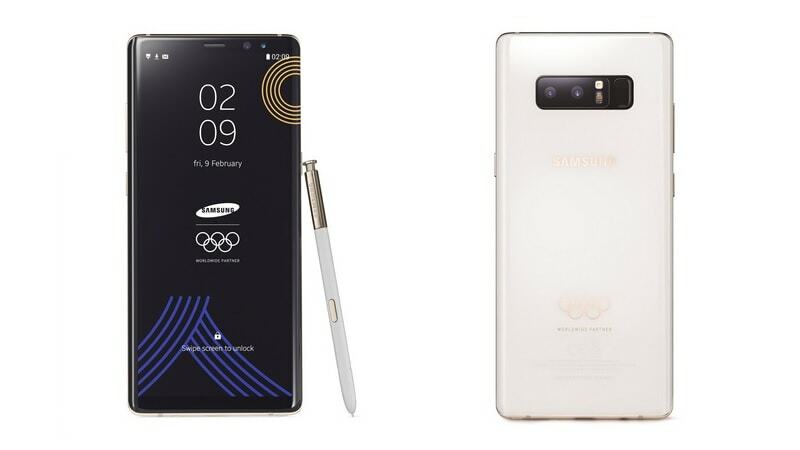 Notably, the new model bears internal hardware identical to the original Galaxy Note 8, though it sports a shiny white back glass and the gold Olympic rings on the outside - inspired by the Olympic Torch alongside a rock golden finish rim and buttons. There are also some golden finish elements on the S Pen that comes bundled with the Limited Edition Galaxy Note 8. As we mentioned, apart from the Olympics-themed customisation, the Samsung Galaxy Note 8 PyeongChang 2018 Olympic Games Limited Edition has the same specifications as of the original Galaxy Note 8 that was launched in August last year. The handset has a 6.3-inch QHD+ Super AMOLED Infinity Display with an 18.5:9 aspect ratio, octa-core Exynos 8895 SoC with four cores clocked at 2.3GHz and the other four cores at 1.7GHz, 6GB RAM, and a dual rear camera setup with Dual OIS (optical image stabilisation). The rear camera setup includes a 12-megapixel sensor along with a wide-angle, autofocus, f/1.7 aperture, lens and OIS, and a 12-megapixel sensor with a telephoto lens and an f/2.4 aperture. The smartphone has 64GB onboard storage that is expandable via microSD (up to 256GB). Besides, it packs a 3300mAh battery and weighs 195 grams. "We're proud to provide the PyeongChang 2018 Olympic Games Limited Edition to all athletes in an effort to help them to stay connected, capture and share one of the most memorable moments of their lives," said Younghee Lee, CMO and Executive Vice President, Samsung Electronics, in a press statement.